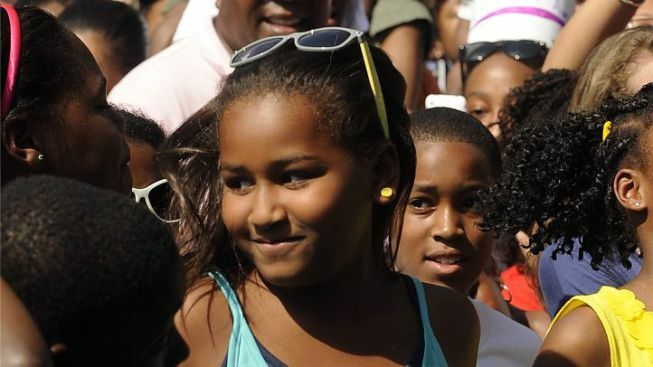 Sasha Obama may not have the cool Fourth of July birthday her big sis does, but the littlest Obama turns 10 today, and she and Malia celebrated with a party at the "D.C. Cupcakes" studio. Carol Joynt reports that she spotted a Georgetown Cupcakes Range Rover packed full of pink balloons arriving at the shop's former storefront on Potomac Avenue, which now serves as the studio for the owners' TLC reality show. "Soon after the arrival of the balloons a squadron of black cars and one long van turned the corner from Prospect on to Potomac and parked at the front door," Joynt writes. "Out marched a dozen or so young women, including First Daughters Sasha and Malia Obama." The party may have also included store owners Katherine Kallinis and Sophie LaMontagne. Check out pics from the party procession here. Michelle Obama grooved to a Beyonce workout video with D.C. students Tuesday. Later today, the First Family will head to Camp David for the weekend.